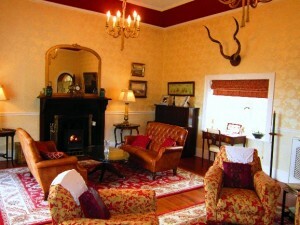 A warm welcome awaits you upon arrival at Mallmore Country House. We invite our guests to make themselves at home and relax in the lounge, where the fire is lit each evening. It is a place to meet with us and other guests for just a chat or to plan routes, day trips and generally exchange information. Tea and coffee is available here all day. There are books, photographs, paintings and a collection of “family treasures” to look at. The rooms have wonderful views of the surrounding landscape, be it Bay or Garden. All our rooms are unique and individually decorated. They are spacious and furnished with thought for your comfort, using antique furniture and fittings. The walls are a meter deep, so no noisy neighbours! Our beds are top quality and are dressed for a good night’s sleep. The house is at the end of a private road, so no passing traffic and lots of free parking. Surrounded by private woodland and boasting wonderful views of Clifden Bay, peace and quiet is the norm! Our breakfast has won several awards and is served in our dining room, which is a converted chapel. We source as much of our fare from local producers as possible and includes Connemara smoked salmon, meats, etc. etc….. Sitting in the garden on a fine summers evening, is another treat and watching the sun setting over the Atlantic Ocean is unforgettable. The only sounds are the wild birds and the sounds of the sea. © 2019 Mallmore Country House B&B.